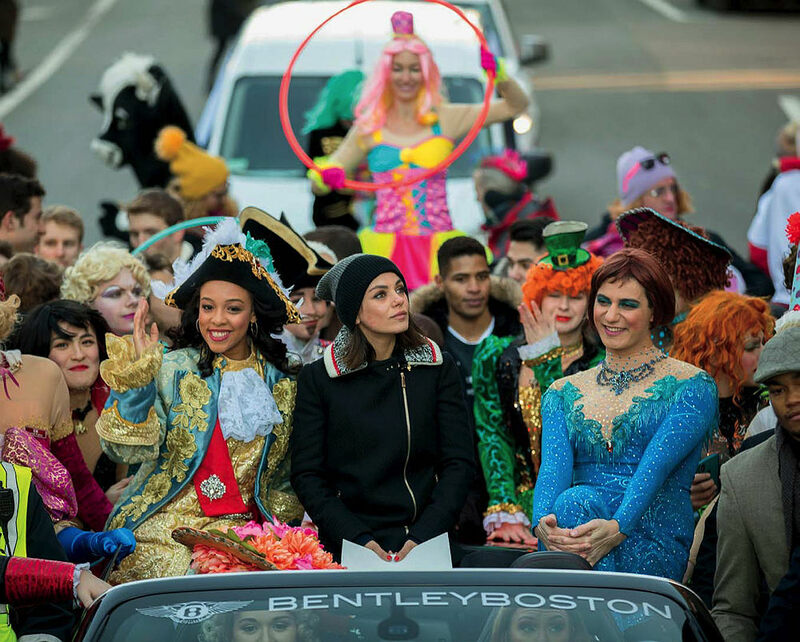 On the occasion of honoring (and roasting) Woman of the Year Mila Kunis—a star of That 70s Show, Family Guy, Black Swan, and other series and films—on January 25 (shown above in the traditional parade), Hasty Pudding Theatricals announced that it would open its heretofore male-only casting to women, beginning this coming fall in preparation for the 2019 production. The parent organization has had female members and officers for decades, but women have been denied roles in the annual show—including those who auditioned during the past three years. Future productions may, as a result, present even more complex gendered situations than those in what will be the last all-male, drag extravaganza, HPT 170, Intermission Impossible, running in Cambridge and beyond this winter. In a succinct ruling issued in early December, the National Labor Relations Board (NLRB) upheld its prior finding that graduate students seeking to unionize at Harvard are entitled to a new election. The NLRB had previously ordered fresh balloting, following its finding that the University had not provided a complete list of eligible voters for the election held in November 2016. (The final tally for that election, the NLRB announced this January, showed that 1,526 students voted against forming a labor union and 1,396 voted in favor.) Harvard had appealed that finding, but the board found that the challenge “raises no substantial issues warranting review.” On February 2, the NLRB announced that a new election would be held April 18 and 19. A full report is available  here. New data on job openings in English, foreign languages, and history depict academic fields in deep recession, if not depression. The Modern Language Assocation’s listings for tenure-track jobs in English and foreign languages have now fallen below the level reached during the recession at the end of the last decade. The American Historical Association’s postings for full-time positions during the 2016-2017 academic year fell to the lowest level since 1984-1985; unfortunately for job-seekers, the number of new Ph.D.s in the field has doubled during those decades, and now equals more than twice the volume of current listings. As discovery proceeds in the Students for Fair Admissions lawsuit alleging that Harvard has discriminated against Asian-American applicants to the College, the U.S. Department of Justice began pursuing similar inquiries last summer. Just after Thanksgiving, a federal request for access to admissions records heated up, with the government claiming that the University was not providing the data it sought in an October query. Harvard’s counsel at WilmerHale responded by offering access to the information at its offices, in a redacted form that protects the confidentiality of applicant and student information—consistent with its presentation of the information in the private lawsuit. The government was “considering” this offer. The Columbia University College of Physicians and Surgeons has announced a $250-million gift from P. Roy Vagelos, LL.D. ’03, former chairman of Merck & Co., and his wife, Diana Vagelos, $150 million of which will underwrite financial aid. The intent is to offer scholarships (in place of the onerous loans medical students often incur) to students who qualify for aid; an estimated 20 percent will receive full-tuition packages. Some $100 million of the gift will underwrite basic research and work on precision medicine.…Florence Irving and her late husband, Herbert Irving, co-founder of Sysco Corp., have given $700 million to Columbia University Medical Center, encompassing New York-Presbyterian Hospital and the medical school, for cancer research and clinical care. The school and the center have been named, respectively, to honor the benefactors’ gifts.…Separately, the Robert H. Woodruff Foundation has pledged $400 million for a cancer-care and -research facility, and a separate health-sciences research facilty, at Emory University, the largest gift in that institution’s history. The 2016-2017 report of the University’s Title IX Office and its Office of Dispute Resolution (which were formally separated last spring), released in December, depicts efforts to expand outreach to the entire community, both at a University level and through dozens of school-based coordinators. The offices are responsible for education, training directly and through the school staff, and pursuit of formal complaints. An early, and perhaps expected, result of the outreach is an increase in the numbers of disclosures to Title IX coordinators and formal complaints filed with the dispute-resolution office. In a message to the community, President Drew Faust wrote, “Sexual harassment and sexual assault degrade human dignity, and they have no place at Harvard.” During the year covered in the report, she noted, the number of complaints increased by 65 percent. Additional details are available  here. The GSD hopes to expand, perhaps by growing toward the Swedenborg Chapel. The Graduate School of Design has announced a $15-million gift from Ronald M. Druker and his family foundation. Druker, a local developer and 1976 Loeb Fellow, is supporting the school’s plan to renew and expand its main Gund Hall facility, which is overcrowded and in need of updating to adapt to new design practices and technologies. This seed funding will start the work; its completion will depend on further fundraising, extending beyond the current capital campaign. In recognition, the school’s primary exhibition space has been renamed the Druker Design Gallery. The Bloomberg Philanthropies-supported American Talent Initiative, begun with 30 member institutions (including Harvard) that aim to increase enrollment of low- and moderate-income students , has grown to 86 schools. Some have begun making specific commitments; Yale, which is expanding its undergraduate cohort by some 15 percent, aims to enroll 150 more first-generation students, and 225 more Pell Grant recipients.…The Howard Hughes Medical Institute, a premier supporter of biomedical research, has launched its HHMI Professors program, recognizing an initial cohort of 14 scientists for excellence in both research and education; they receive grants, typically of $1 million for a five-year period, to explore new approaches to science education. Initial recipients are based at institutions including Berkeley, Cornell, Stanford, the University of Texas at Austin, and Yale, among others. On to ’22. The College admitted 14.5 percent of early applicants to the class of 2022  (964 of 6,630 hopefuls). It reported that they are an especially economically diverse cohort, with first-generation college students making up 10.6 percent of those admitted. Harvard square’s evolution. The retail and office properties at 1-8 and 17-41 Brattle Street have been sold to North Carolina-based Asana Partners, a real-estate investment-management firm. The transactions took place against a backdrop of ambitious plans to redevelop the properties across the street into a high-end retail mall, and other projects, such as replacing the theater complex on Church Street with offices and new cinemas. Upon assuming ownership, Asana outlined only cosmetic changes for its new properties. For full coverage of the status of the Square, see this report .